If you set out to create an increasingly fragile economy, you'd do precisely what the Federal Reserve and our political "leaders" have done. All the extraordinary measures deployed since 2008 to jumpstart the U.S. economy are one-offs: either they cannot be repeated or they have lost their effectiveness. As a result, we now have an extraordinarily fragile one-off economy that is dependent on "emergency" measures that cannot be withdrawn even as their utility in the real economy dwindles by the day. These two dynamics--declining effectiveness and unrepeatability--have created a uniquely fragile economy. Once you become dependent on extraordinary fiscal and monetary stimulus, withdrawing the stimulus will trigger a recessionary cascade. But continuing the stimulus cannot duplicate its initial effectiveness, as malinvestment and unintended consequences degrade the initial boost. We cannot add another $1 trillion in borrowed money to the $1.3 trillion we're already borrowing every year. The Federal Reserve could expand its balance sheet by another $2 trillion, but in sharp contrast to its earlier injections, the "high" from its latest QE stimulus was next to non-existent. Consider the effects of expanding money supply and lowering interest rates, the Federal Reserve's two primary policies of sparking escape velocity, i.e. a self-sustaining recovery. 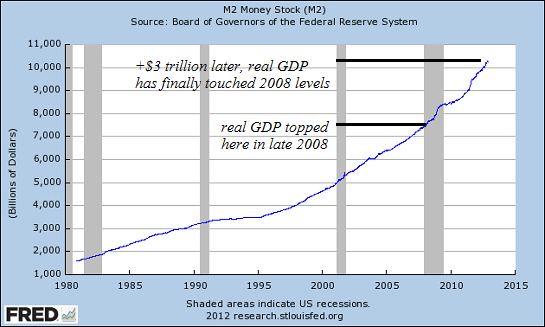 Now look at M2 money supply. It has shot up by about $3 trillion since late 2008. All that expansion accomplished was a return to pre-recession levels. But this is only part of the picture, as unprecedented Federal fiscal deficits pumped $6 trillion in borrowed money into the GDP in that time frame. So $9 trillion in "free money" merely kept the economy flatlined. If this is a self-sustaining recovery, then we should be able to eliminate the $1+ trillion we're borrowing and blowing every year above and beyond 2008's $300 billion deficit, and we should be able to restrain money supply expansion, too. Everyone know what would happen if Federal spending returned to 2008 levels (i.e. 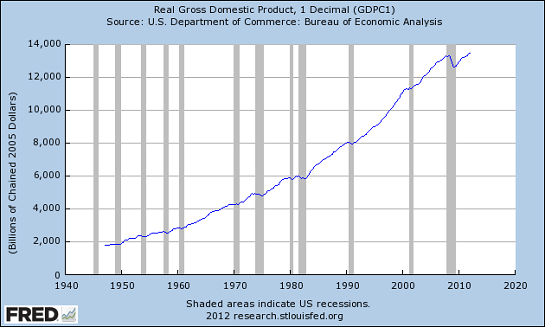 $1 trillion less annually) and money supply stabilized: the economy would fall off a cliff. 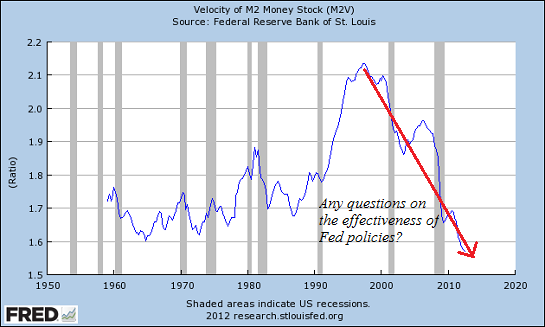 Here is the velocity of money. You know the fable that periodically makes the rounds via email: a single $100 bill that comes into town circulates from hand to hand and ends up paying off everyone's debts in the entire town. The velocity of that $100 was very high. If the same $100 was stuffed under a mattress, its velocity would be zero. The Status Quo is now trapped in a brittle hall of mirrors. Its fiscal profligacy has fueled malinvestment on a grand scale, not a self-sustaining recovery, and its reckless monetary policy of endless easing and zero-interest rates (ZIRP) have led to a dead-money economy: there is plenty of money sloshing around but either A) those who want to borrow it are not qualified to borrow it or 2) those who are qualified to borrow it have zero interest in borrowing it; they are desperately trying to pay down their existing debts, not acquire more debt. Who has access to this liquidity? The financiers whose gambles are subsidized and backstopped by the Federal Reserve and the Treasury--the very players who triggered the 2008 global financial meltdown, the very players whose gargantuan losses we are still paying for. If you set out to create an increasingly fragile economy, you'd do precisely what the Federal Reserve and our political "leaders" have done: take politically expedient one-off stimulus policies and extend them into permanent policies. Thank you, Stephen W. ($20), for your wondrously generous contribution to this site -- I am greatly honored by your support and readership. Thank you, Karl L. ($50), for your stupendously generous contribution to this site --I am greatly honored by your continuing support and readership.